Green Graffiti : Cooling Down or Heating Up? Cooling Down or Heating Up? The summer season is here and the predominant thought in our minds is ‘how to stay cool’? While some years back, we would have considered a variety of traditional ways to beat the heat, today the most common option, at least in our cities, is to install an air conditioner in the house. Not only does it actually cool down your home, metaphorically too it is ‘cool’ to install an appliance like this – owning an air conditioner pushes up your social status! Today, in India, we can actually see the rapid increase in the use of air conditioners all around us; the statistics too corroborate this fact. For example, last summer (May 2013) Panasonic announced that it had crossed the milestone of one million air conditioner sales in India since entering the country in 2008. In other words, a single company added a million air conditioners to our country in just 5 years! But are air conditioners really ‘cool’? The unfortunate answer is no! Believe it or not, air conditioners are one of the big contributors to global warming. So while they may cool down our homes, they are actually heating up the planet! Refrigerants — the fluids that absorb and release heat efficiently at the right temperatures — are the key to air conditioning. Until recently, the most common refrigerants used in air conditioners were chlorofluorocarbons (CFCs). However, the discovery that CFCs were major contributors to the depletion of the ozone layer led to the creation of the ‘Montreal Protocol on Substances that Deplete the Ozone Layer’, which came into effect in 1989. The Montreal Protocol has managed to substantially reduce, and in some countries even to eliminate, the use of CFCs. The CFCs were then replaced by hydrochlorofluorocarbons (HCFCs), which have a greatly reduced impact on ozone depletion. Today, from HCFCs we have moved on to HFCs (hydrofluorocarbons) which have no impact on ozone depletion because they do not contain chlorine. Unfortunately, the bad news still continues! It has now become known that HFCs are super-greenhouse gases with a high potential to contribute to global warming. The frightening part is that we now seem to be trapped in a vicious circle. 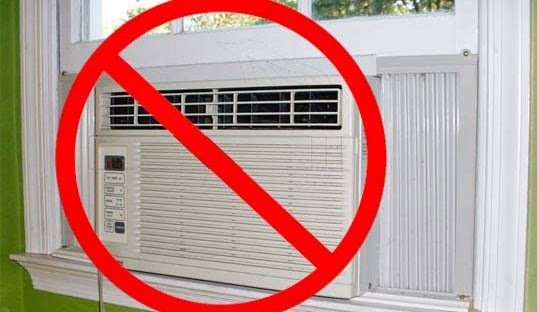 We use air conditioners to fight the heat, air conditioners contribute to global warming, global warming is pushing up temperatures and making summers extreme, the hotter it gets the more we turn to air conditioners – this is a story that can have no happy ending! The only solution is to break out of this cycle by saying no to air conditioners and returning to the traditional ways of staying cool in the summer. For hundreds of generations people managed happily without air conditioners, why can’t we?